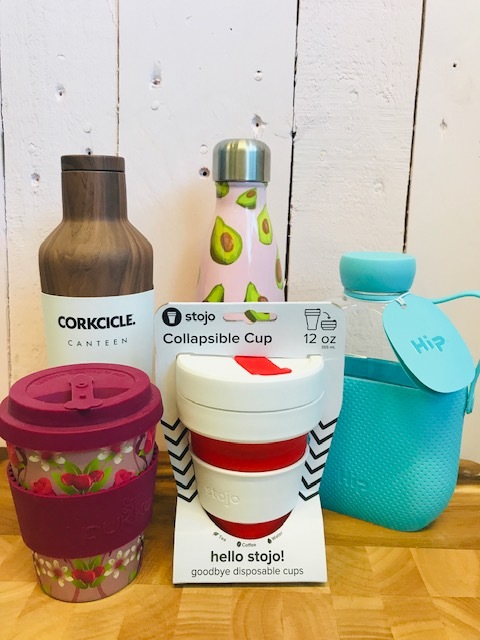 Reusable bottles and cups are a great sustainable alternative to disposable cups and are an amazing way to help the environment by decreasing your use of plastic. There are so many companies offering fantastic environmentally friendly bottles and cups, which make them even better! Here are some of our favourite reusable bottles. This cup is made from bamboo, which is claimed to be the world’s most sustainable crop. This is due to the root system of bamboo, which reshoots once it is harvested. Bamboo is also organic and doesn’t require any fertilisers, making it even better! This cup comes in three different designs and is dishwasher safe. Priced at £8.99 this is a great environmentally friendly option that won’t break the bank and looks great too. If you are often on the go, this cup will be great for you. The Stojo collapsible cup collapses into a leak proof disk that is less than two inches tall, which makes it perfect to fit into your bag. The cup is made from food grade, recyclable materials, with the aim of decreasing the use of disposable cups. The cups come in a range of colours and sizes, so there is a cup for everyone. The cups are also dishwasher and microwave safe. With prices starting at £9.99 for the 355ml cup, these cups are great for being on the go. The Hip water bottle is made from BPA free materials, is reusable, recyclable and dishwasher safe. This bottle offers a sleek design that comes in a range of colours, with a 650ml capacity. Hip also offers a 355ml coffee cup, so don’t panic if you wanted a cup for your hot beverages! The best thing about Hip bottles is that when you purchase a Hip product, two days of safe drinking water is given to someone in need through Hip’s partnership with Water For People, who have a program for 9 countries. The Hip water bottle is priced at £14.99, which is extremely reasonable considering every purchase provides two days of clean drinking water. Chilly’s aim is to accelerate the use of reusable products and to do this they have created a leak proof bottle with advanced double wall vacuum technology, which keeps your drink cold for up to 24 hours or warm for up to 12 hours. The bottles are made from high grade stainless steel, making them BPA free and extremely durable. These bottles come in a huge variety of colours and come in sizes of 260ml, 500ml or 750ml and they also offer coffee cups, which come in sizes of 230ml or 340ml. These cups, however, are quite pricey, with prices ranging from £20 – £30, depending on the size and design. Corkcicle first launched in 2010 as an in-bottle wine chiller, but since then they have branched out into the world of reusable bottles. These bottles have a proprietary layer of insulation which keeps drinks cold for up to 20% longer than other insulated bottles- 25 hours to be exact! Corkcicle has partnered with the non profit charity Water to help fund bringing clean water to those who need it. 5% of all sales go towards bringing clean water to those in need, which is a great cause! These bottles come in a huge variety of shapes, sizes and colours, so there is sure to be a bottle for everyone, including canteens, tumblers and even stemless wine glasses and flutes. Depending on which bottle you go for you could be forking out around £20-£35, however 5% of this does go to charity to help bring clean water to those in need.